I’ll keep this simple and direct—I figure whoever is reading this review wants to cut through the words and get to the facts. So here goes…. My bathroom was about 10 years overdue for a rehab. While shopping at The Tile Store in Moorestown, I picked up a list of suggested tile contractors. I studied online reviews of several of these contractors, but one stood out—Creative Remodeling & Design. My first meeting with owner Joe Sananes went great. I felt comfortable with Joe right away. He had great ideas and advice for our project. Within a week, we had a written estimate. There was nothing tricky about the job’s price estimate. The contract was clear. It spelled out what any extras would cost—special doors, glass shower enclosure, in-wall medicine cabinet etc. Basically we paid for anything outside of the walls: Vanity, fan, tile, toilet, etc. No surprises. CR&D is a busy company and it took a while to get on their docket. Since we were willing to have work done during the holiday season, they started work sooner than expected. The crew was professional and hardworking. Raphael was our main man. He was at our house every day by 8:00 am and worked until close to 6:00. Raphael is an artist when it comes to tile, matching sections in ways I would have never thought to. Every night they cleaned up. Our house is old and there were a few unexpected hold-ups, but I feel the cost of that extra work which was needed to remedy structural problems, was fair. I also feel that because of Joe’s experience and knowledge these problems were dealt with efficiently. Joe helped me pick tile (yes, at The Tile Store) and has great design ideas. I know that my project looks better because of Joe’s involvement. 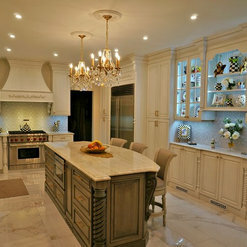 I enthusiastically recommend Joe and Creative Remodeling and Design for your next project. We will be moving to our next project very soon. I recently hired Creative Remodeling to remodel my upstairs bathroom. Joe and his guys were great to work with and did an amazing job! Joe's design expertise really helped us get the best use out of the space, and his crew worked tirelessly (even through the holidays). They were responsive, punctual, and very hard working. Even after some problems were discovered during the demo (poor piping, leaking roof etc), Joe and his guys stayed on track and got the job done on time and on budget. 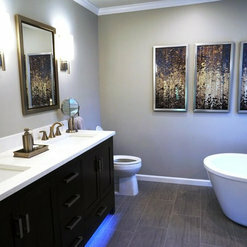 The bathroom looks great and I would definitely hire them for future projects and recommend them to others. Overall great experience with Creative Remodeling. Joe and his crew were very easy to work with and Joe was very responsive. Joe helped us through the creative process and helped us identify ways to have the project fit in our budget. Our master bath turned out better than we could have ever imagined. Photos below are what the bathroom looked like when we purchased the house and then what it looks like after Joe’s magic. We were very pleased with Joe and his staff. Starting with our first appointment Joe demonstrated professionalism and passion about our job. At each phase of the job, Joe provided detailed updates and progress. 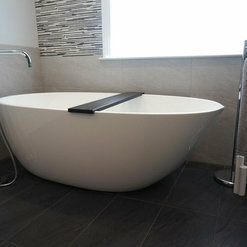 The finished job was amazing, the craftsmanship and the attention to details was superior. We are extremely happy, that we chose Creative Remodeling over other companies in the area. Joe is an absolute pleasure to work with! We have worked with him on several projects and have always been incredibly pleased with his professionalism, attention to detail, and pristine project completion from start to finish. We are honored as a company to have Joe use our products and are consistently blown away by his immaculate installation skills. 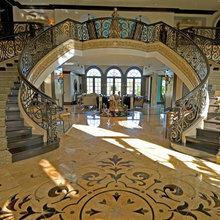 If you should ever be so lucky as to hire Joe for your project, we can guarantee you will be pleased beyond belief. Thank you for always making our products look so SO good! The whole process was smooth from start to finish. There were no surprises. We worked in detail with Joe in every stage of the remake. He has an excellent eye for layout, decor, and style. He was patient with our indecisions and he guided us through keeping us informed of the pricing, timetable and process. We found his crew to be excellent as well and were comfortable having them in our home. I would highly recommend them and use them again. Thank you so much for your Kind words Brian! It was a pleasure to work with you and Debbie, and I'm very happy you are satisfied with your new beautiful Master bathroom ! 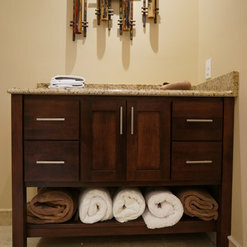 Joe and his team recently remodeled our master bedroom and bath, as well as a powder room. Joe is very passionate and detail oriented. He offers assistance and suggestions from start to finish, which makes the process less overwhelming. His guys are friendly, very trustworthy, and professional. 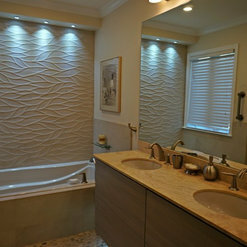 We love the results and would highly recommend Creative Remodeling. 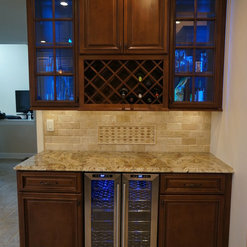 The Creative Remodeling team did an excellent job installing our backsplash! They did everything exactly how I wanted it and I love how it looks! They were very helpful with all of my design questions in the kitchen! I loved working with Joe Sananes (owner) from Creative Remodeling & Design on my new master bathroom remodel and cannot be more pleased with how everything turned out. Joe takes great pride in his work and has a customer focused mindset. The quotation process: What I really liked about the process was that the project quote includes a breakdown of labor, basic materials and options / suggestions; everything else, such as tile, bathtub, fixtures, etc, I pay for before the project starts. The upfront visibility of the cost breakdown really allowed me to control my budget and where I wanted to spend my money. 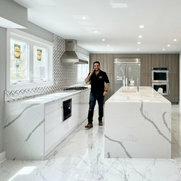 Design and material selection: Joe envisions our project as if it were his own master bathroom remodel and he listened to all of our design needs and ideas and presented many options and opportunities to us. 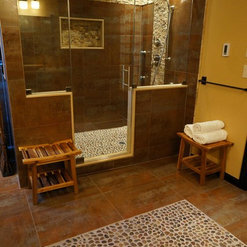 Joe also has a great eye for design and suggested some beautiful design patterns that were incorporated into our master bathroom. We trusted him so much, that we asked him to pick out hardware and paint color for us! He accompanied us to every appointment at the tile shop and plumbing store and guided us through the process to pick out the best materials for our needs. Joe also extends his contractor's discount to his clients! The remodeling process: It is not easy to live in the same house were there is construction work going on, so it was so great that Joe and his team delivered the project on time! Joe is at the work-site daily, and makes sure to touch base with me to discuss progress and to address any concerns. Every day, his crew would lay down protective material on the floor and would clean-up before they leave. Towards the end of the project, Joe generated a punch-list, which I added to, to ensure all aspects were addressed. The crew: Jorge and Luis were professional, punctual, hardworking, courteous and respectful. I felt completely comfortable trusting them with my house, while I was at work. 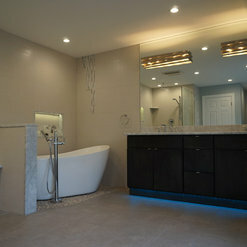 Our finished master bathroom exceeded expectations in every single way! 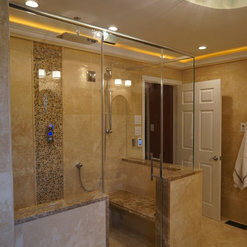 I highly recommend Creative Remodeling & Design and would only use them for any other home remodeling projects. 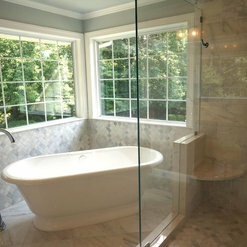 Joe and his team are fantastic and I would highly recommend them to anyone that needs a remodeling job completed. Not only do they do phenomenal work, you can trust them to the fullest. You can trust that Joe will help you make the best creative decisions possible, you can trust that he will keep you informed of when the job will start and progress on ordering materials, and you can trust that his team will do a fantastic job installing everything. Joe is cost conscious and never tries to get you to spend money where it is not necessary and he never pushes you to make decisions you are not comfortable with. His team is courteous, professional, friendly, and they always clean up their work area each and every day. Our job came out better than we could have ever possibly imagined. Joe and his team really bring your dreams to light. I highly recommend them for any remodel job. We have had experience working with Joe Sananes of Creative Remodeling on a number of projects – guest bath, master bath, and a new second-floor laundry room. He recently completed a full kitchen gut-renovation along with the great room and powder room, including installing new wood floors in the family room that seamlessly blended into existing wood floors in the kitchen area. Joe is the consummate professional and it has been a pleasure to work with him. From our first project with him, we knew we had found our renovation partner. Joe is a good listener and truly wants to satisfy his clients. He offered creative solutions and compromises for every problem that we encountered and was upfront about what was possible and what was not. He addressed our requests for changes and modifications along the way with patience and a smile. It is clear that client satisfaction is most important to Joe. We are extremely pleased with the outcome, but the renovation process was smooth as well. Joe’s team is also very professional and courteous. They are a pleasure to work with. We recommend Joe most highly. Commented: Love this bathroom!!! !Thank you for your feedback. 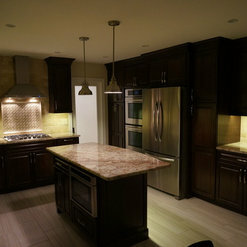 The cabinets are Shaker style solid Maple with Espresso stain.